In my last post I raised a hypothetical question which placed Shuri-te in a somewhat unfavorable light. Of course, Shuri-te was meant in sense of Itosu Ankō’s school Karate syllabus. Today I would like to relativize and rectify this biased perspective by a simple fact: there was no style of Karate ever that solely taught pure Itosu school Karate. This can be seen in the personal tradition of a comparatively unknown old-style Karate man. When in 1914 Funakoshi Gichin published his talks of Asato Ankō in a newspaper article, in one section of it he mentions the various Bushi active at his time in Okinawa. Among these are named Itosu Ankō, Higaonna Kanryō, Aragaki Seishō, Kuwae Ryōsei, Yamane Chinen, Yabu Kentsū, and Hanashiro Chōmo. In the same breath he mentions a certain Mr. Kiyuna. Three years earlier, on January 24, 1911 (Meiji 44), a Karate meeting of the Shuri Teachers College took place. Beginning at 2 p.m., the whole teachers college gathered in the courtyard, with Yabu Kentsū serving as instructor. First, a large number of teams of teachers college pupils performed Karate and Kumite. Afterwards middle school pupils invited as guests demonstrated various sets of Karate. Finally, a number of seasoned masters present that day performed Kata. Among these was a certain Mr. Kiyuna, who performed Passai. Other performers included Funakoshi Gichin (Sēsan), Yabu Kentsū (Gojūshiho), Itokazu (Naihanchi) and others. Neither Kiyuna’s Passai nor Funakoshi’s Sēsan were kata of Itosu’s school Karate syllabus. Photo of Itosu Anko. Source. Wikipedia. After the demonstrations, around sixty pupils were granted awards of excellence for their various performances. Among the awardees was Tokuda Antei (1884–1979). Antei entered the Shuri middle school in 1905, the year Karate was introduced as a compulsory school subject of physical education. He graduated five years later, in 1910, in the 22nd graduation class of the Shuri middle school. After that he entered the Shuri teachers college, where he continued to receive karate instruction as a member of the Teachers College Karate Club for a period of one year. In other words, he experienced the original Karate taught in the Okinawan school system. 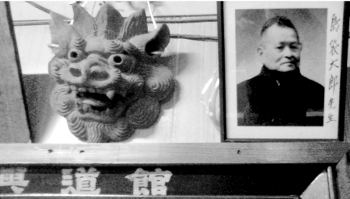 Most Karate people know him, although few might remember why: It was from this Tokuda Antei’s personal photo album that the famous photo of Itosu Ankō came from. It seems Tokuda Antei did not start a style of Karate, nor did he teach students. But he wrote a memorandum titled “Miscellaneous thoughts on Karate”. According to it, jūdō, sumō, and karate were performed for the first time during his school years. Under both Hanashiro Chōmo and Yabu Kentsū, Antei with about twenty other volunteer students practiced such basic techniques as Naihanchi inside the grounds of the Okinawa Ginko Bank at the remains of the former national academy (Kokugaku) in Shuri Tōnokura. Occasionally Antei went to the house of Higaonna Kanryō in Naha, where he practiced Sanchin, later received instruction by Itosu Ankō not only in school, but also was present at “summer lecture meetings” at Itosu Ankō’s home, with all sorts of performances by Hanashiro Chōmo, Yabu Kentsū, Funakoshi Gichin and others. Antei also visited “Yamanni” Chinen in Shuri, as well as other masters, including “Kiyuna no Tanmē of Tamaudun”. Well, no explicit style (ryūha) of Kiyuna remained extant in direct line. However, both Miyahira Sei’ei and Shimabukuro Tarō were his personal disciples. In Okinawa several dōjō followed the tradition of these two men. As regards Miyahira Sei’ei (1895–1958), he was a teacher of Higa Yūchoku of Kyūdōkan. According to a written note by Higa, Miyahira’s punching power was so strong that “he could fell a bull with one strike.” Miyahira’s tradition is widely known as Tījikun-bushi, i.e. “veteran warrior of exceptional boxing skills”. Note that the lineage of Tījikun-bushi here solely refers to the exceptional boxing skills of the real royal guards which was handed down in the lineage Matsumura Sōkon → Kiyuna Pēchin → Miyahira Sei’ei → Higa Yūchoku. Next, let’s turn to Shimabukuro Tarō (1906–1980). He was born the eldest son of a sake brewer family in Torikohori Village of Shuri (today’s Shuri Torihori town in Naha City), a neighborhood were many experts of old-style karate were born and raised. His father was an enthusiastic supporter of good education and generously invested in the education of his children. Tarō’s three sisters left the 1st Prefectural Higher Girls’ School as teachers. As the oldest son Tarō was expected to become a teacher of both the literary and military arts (bunbu), or a businessman. Living up to the expectations, he was honored as a highly brilliant person at Naha Commercial School and was appraised as the “hidden warrior of scholarship” (gakumon no kakure bushi). His father was concerned about his attitude as he also obsessively practiced Karate at the family’s home but was relieved when shown the report card of his schoolwork. He especially excelled in English. In the postwar days, when questions came up between Americans and his aunt, who ran a traditional Japanese restaurant, his command of English was always helpful. Shimabukuro Taro, original photograph by the author, shot at Matsubayashi Kodokan Honbu Dojo in Naha, 2009. During his elementary school days Tarō learned Karate from Tokuda Anbun (1886–1945), during his middle school days from Shiroma Shinpan (1890–1954), and during his time at the Commercial School from Chibana Chōshin (1885–1969). He also studied from Kiyuna Pēchin. As he was from a wealthy family, after graduation he did not need to work for his living. Although nominally the fifth generation heir of his families liquor business, he rather visited the distinguished masters of Shuri and Naha, requesting instruction in Karate. It is said he lead a life concentrating on Karate to such an extent that he forgot eating and sleeping. At least in this sense many of us are very similar to him. Arakaki Ankichi was his senior schoolmate. Together they studied under Kyan Chōtoku in the 1920s. Kyan particularly encouraged both of them to go out and travel about outside Okinawa prefecture to gain skill in combat (musha-shugyō). Besides, Tarō also studied under Iha Kōtatsu (1873–1928), from whom he learned Rōhai, Wankan, and Wanshū as skills handed down in the Tomari region. From Arakaki Ankichi he learned Passai, from Yabu Kentsū Gojūshiho, from Miyagi Chōjun he learned Sanchin, and from Go Kenki he learned Hakutsuru. In Kobujutsu, Tarō studied under Chinen Masami of Yamane-ryū and Yabiku Mōden, the forefather of Taira Shinken lineage Kobudō. Due to the outstanding amount of practice and the multiplicity of actual combat he had experienced, Tarō eventually came to be called the “Demon of Karate” (karate no oni). The “Demon of Karate” continuously researched the correlation between kata and kumite. According to his conviction, Kumite blooms until one’s 40s, but Kata becomes one’s lifelong friend. In addition, working on distancing skill (maai), he daily trained on three relatively limber Makiwara, always assuming actual combat and carrying out the practice of thrusting while moving back and forth and left and right, using all three targets. As regards atifā, he explained the meaning of “one punch, certain kill” (Ikken hissatsu) as “The chicken beak is better than the ox tail”. That is, for the purpose of aiming at vital spots (kyūsho), the slippy chicken beak (called Keikō) is better than the sluggish ox tail. For example, when aiming between the ribs (intercostal), attacking by means of spear-hand (Nukite) is the most effective means. In this regard Tarō seems to have been of the same opinion as Motobu Chōki. Although of short height, he had a brawny giant’s physique. While he was of a gentle and thoroughly helpful nature he was viewed by society as a rather boorish man, and though people respected him most kept a distance. Good looking and also owing money, friendly and also capable of Karate, it is said that he enchanted numerous women with his personality of being tough on the outside but soft at heart. When Nagamine Shōshin was young he asked several experts for instruction. While he began in 1923 with Kuba Chōjin of Tomari-te fame, Nagamine also visited Tarō. Tarō did not only emphatically teach Nagamine in Karate – we might assume that Matsubayashi’s masterpieces of Rōhai, Wankan, and Wanshū came from both Tarō AND Iha Kōtatsu! – but also introduced him to his own teacher, Arakaki Ankichi. Arakaki in turn also introduced Nagamine to his own teacher, Kyan Chōtoku. Other important disciples who received direct personal instruction from Tarō were each Uema Jōki (1920–2011; Shubukan), Ishikawa Seitoku (1925–2013; Ryūbukan), and China Teikichi (1924–2003; Okinawa Shōrin-ryū Karate-dō Kyōkai Buseikan). Shimabukuro Tarō passed away in 1980, at the age of 74 years. Yokoyama Kendō: Satsuma to Ryūkyū. Tōkyō, Chūō Shoin, 1914. Matsuda Mitsugu: The Government of the Kingdom of Ryūkyū, 1609-1872. A dissertation submitted to the Graduate School of the University of Hawaii in partial fulfillment of the requirements for the degree of Doctor of Philosophy, January 1967. Gajumaru Tsūshin. No. 21. May 14, 1999. Takamiyagi Shigeru et.al. : Okinawa Karate Kobudō Jiten. Tōkyō, 2008. Funakoshi Gichin. Okinawa no Bugi (Martial Arts of Okinawa). Ryūkyū Shinpō, 1914. Tomikawa Seiboku: Shihan Gakkō Karate Taikai (The Karate Meet at the Teachers College). 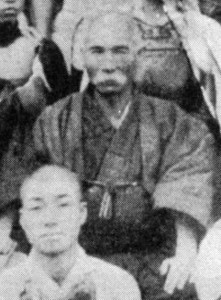 Ryūkyū Shinpō 1911. Tomikawa Seiboku: Karate Shōreikai (The Karate Promotion Meeting). Ryūkyū Shinpō. Funakoshi Gichin. Okinawa no Bugi. Ryūkyū Shinpō, 1914. Gaya Seiyoku: Karate no Tatsujin-tachi ga Ichidō ni Atsumatta Kinō no Shihan Gakkō Bujutsu Kenkyūkai (Yesterday Masters of Karate Gathered for a Martial Arts Seminar at the Okinawa Teachers College). Ryūkyū Shinpō 1918. Kinjo Hiroshi: Itosu Anko Okina. The Restorer of Karate. A photo of Ichiji [Itosu] no Tanme Finally Revealed. English translation by Patrick & Yuriko McCarthy. Okinawa Times, Morning Paper 1st Edition, Monday 20 Mar 2006. Motobu Naoki: Wasuresarareta Karate no Tatsujin-tachi (Forgotten Karate Masters). 19 February http://ameblo.jp/motoburyu/entry-12130567658.html, retrieved 2016/03/11. Andreas Quast: Karate 1.0. Self-published, 2013. This entry was posted in Unknown Ryukyu and tagged Arakaki Ankichi, China Teikichi, Ishikawa Seitoku, Kiyuna, Kyan Chotoku, Matsumura Sokon, Nagamine Shoshin, Shimabukuro Taro, Uema Joki. Bookmark the permalink.